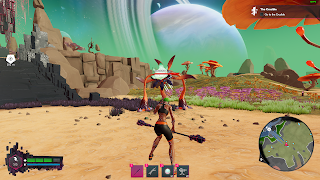 NOTE: Eden Rising: Supremacy had an extensive update on 18th October 2018. This update makes some information in this article out-dated. You can read our article about the update here. 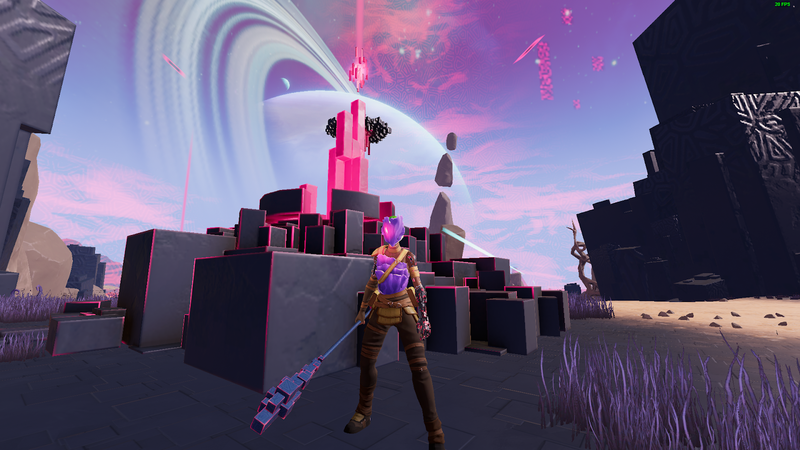 Eden Rising: Supremacy is a game by Canadian developers Nvizzio Creations, created from the former Funcom Montreal studio. The game is designed to be played co-operatively between up to 8 players, although with scalable difficulty can be played solo, and blends the genres of open world survival and tower defense set on the alien world of Eden. 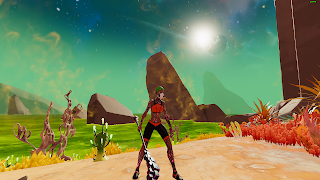 After some very basic character customisation (currently there is only a female model and a limited number of colours for skin, base layer and hair with more customisation options due for full release) you are introduced to the story of your arrival on Eden. Having discovered an alien blueprint you have crafted a portal and passed through this to the world of Eden where you are find yourself in front of a green sulphurous ocean. You are greeted by ‘the Steward’ an alien intelligence who will guide you through the tutorial and early stages of the game. The Steward observes that your human body is not suitable for living on Eden and makes a bargain, it will make an alteration to your body if you agree to become a Warden of the crucibles and restore these to access their archives. 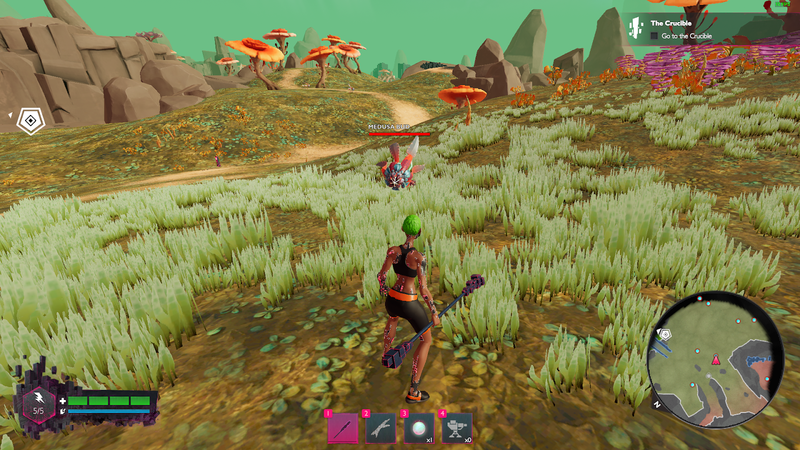 Following this opening introduction to the core mechanics you enter the world and complete a short tutorial introducing you to the main mechanics of the game (movement, combat, gathering and crafting). After moving up the hill and completing these various actions you come across a Telesite, part of a mid-range transportation system that you will develop as you explore and progress through the story, and a transported to the main continent of Eden where the majority of gameplay will take place. A short way down the path there is a cut-scene which directs you towards the first of the four available crucibles which you need to activate and defend from the creatures of Eden (where the tower defence element comes in to play in the form of sieges). After following the path down the hill and gathering some resources along the way (stopping to craft your first piece of gear the Fungal Cuirass on the way) you come upon the first of the monsters of this alien world in the form of some Medusa Buds and a Gorgon. After arriving at the crucible and activating it, a protective forcefield comes up protecting the crucible and also providing healing effect over time to players within it. Now you can activate your first siege. Each crucible has a number of lanes where you can be attacked so you will need to distribute traps, turrets and players strategically, each item has a power cost and you have a limited amount of power available which increases as you progress. This first siege has some ancient traps already placed for you to take advantage of. Upon completion you are awarded your first technology from the crucible archives in the form of weapon blueprints for an improved melee weapon, the acrobatic Fungal Glaive, and the first ranged support weapon, the Fire Slinger. You are also awarded essence which allows you to upgrade the crucible with things such as factories which produce turrets or upgrade points to increase damage dealt by turrets or reduce the cooldown as they recharge. Currently there is about 30-40 hours of content over four biomes if you don’t take time to just explore the landscape, with more planned as the game approaches final release. 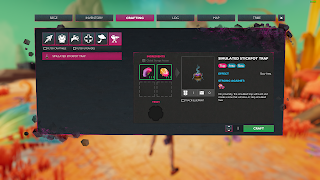 It’s very easy to lose an hour or more and realise that you haven’t actually completed any sieges to advance in the game, but exploration is rewarded with some items being unlocked upon discovery of the relevant resources, such as cosmetic dyes for your armour, rather than through the crucible sieges and weapon or armour tech by discovering and completing Outposts. Overall the game feels in good shape for an Early Access title from a small developer with nice visuals and an improvement in performance and combat systems so far in the EA cycle. The team appear to be taking player feedback on board when planning their updates by both including bug fixes and implementing new features and system refinements based on player feedback. Certainly there are still some areas which need work with combat sometimes feeling a touch unresponsive, although this has been improved in an update this week, and areas of the map where your character can get stuck but the game feels to be going in the right direction. The developers also have a Discord server where you can provide feedback and speak directly with the team.